Staff Don’t Leave Jobs, They Leave Managers. Posted on 27/11/2018 | by Leigh | Leave a Comment on Staff Don’t Leave Jobs, They Leave Managers. You’ve probably heard that phrase before, that ‘staff don’t leave jobs, they leave managers’. And we’re here to tell you that it’s true. 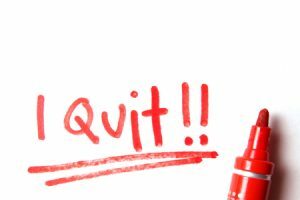 The number one reason for people quitting their jobs is because of their manager. 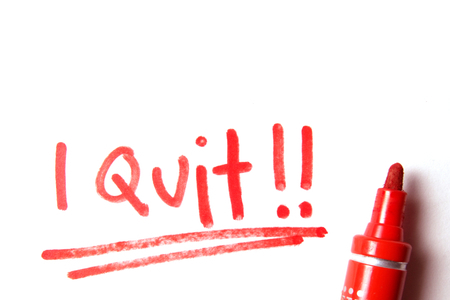 75% of people who voluntarily leave their jobs do so because of their boss. No matter how good a position might be, not matter how good the job benefits, staff will quit if the reporting relationship with the person in charge is poor. Today on the blog we look at why this is the case, and the types of managers that staff will gladly leave behind. Why do staff leave managers? Staff leave managers more often than not because they are at least one of four things: under-valued, under-paid, undermined and under pressure. Work is never going to always be a barrel of laughs, but it shouldn’t be somewhere that staff dread going to either. 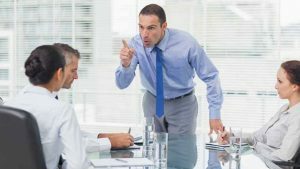 Bad bosses are the number one cause of unhappiness at work. If a staff member is unhappy, don’t be surprised that they are going elsewhere to look for work. Your staff spend most of your life at work, they shouldn’t feel anxious or drained there. What kind of bosses or managers do staff want? Staff look for bosses who are leaders but not demanders. They want bosses who know when their plates are full as it is without piling on extra loads of work and expecting quick and good results. They want bosses who are encouraging and who acknowledge greatness. Staff want people in charge who are going to pay them fairly for the amount of work they’re doing. What kind of bosses do staff members leave? The ‘King Kong’ Boss: Some managers forget where they came from. These type of managers possess a superiority complex and like to draw the distinction between management and staff. It is dreadful to work under a manager who is more worried about pushing their weight around than building relationships. Great leaders should never talk down to their employees or make them feel inferior. Remember where you started and be respectful to everyone. The ‘Task Master’ Boss: Who piles on work constantly to employees without checking how much they already have to do. This type of boss is usually great at dishing out tasks but completing none of their own. Giving too much work to staff before they have even completed their own mandatory day to day tasks is a sure fire way to kill staff morale and motivation. Think before handing out tasks ‘what can I do to take some of this work load away from my workers?’. If you don’t you’ll push them to a breaking point, where they will feel under pressure and stressed out. This might lead them to taking time off or actually quitting. ‘Task Master’ bosses are usually found in smaller organisations where there are less staff to spread the work out across. The ‘Stuck in Old Ways’ Boss: Staff leave bosses who don’t move with the times. If you’re paying them what you paid them 5 years ago even though they’re now doing a lot more work, they’re going to leave. If you’re not letting your staff try working in new, modern ways, they’ll leave. Maybe you won’t let anyone try anything new. People don’t like bosses who don’t like change. If you’re stuck in your ways to the point where you’re holding your staff back, don’t be surprised when you’re having to fill vacancies. There are too many exceptional employees out there that become disheartened, stop caring but force themselves into work everyday until they find another job. If you’re a manager, take a look at yourself and ask yourself if you are truly a good one. No matter how good a job is, staff certainly won’t stick around for you if you are not treating them correctly. Remember, staff don’t leave jobs, they leave managers.